I someone could explain my questions I'll be very happy. I suspect it would be a spark gap that hopes to provide a path to earth-ground during over voltage events like a lightning strike. That distance between the two bends would be a pretty accurate voltage regulator in that it would arc at a pretty specific over-voltage. The insulator itself is a fairly lousy 'regulator' as its stand off voltage will vary greatly based on age, dirt, and moisture. Hi Keith! Thanks for the answer and the kindness. 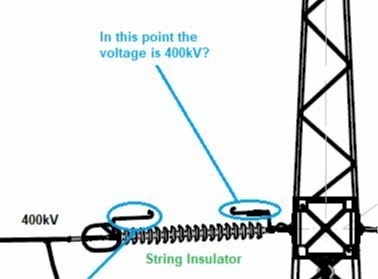 But I still have not noticed something ... in this drawing ... in normal operation, without over-voltages, on the substation side the voltage is 400kV? I'm sorry if the question is stupid, but I do not understand anything about this area. That end of the string is at zero volts. Point A is 230kv, point B zero volts. 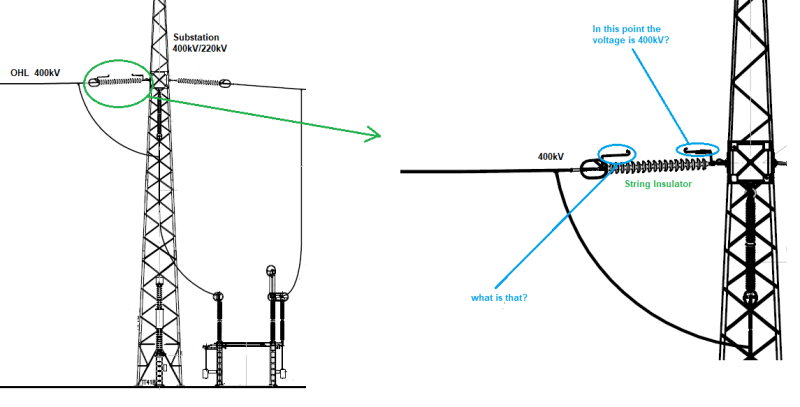 Hi Mbrooke!Thank you for the answer...but why point A is 230kV and not 400kV? It is true, of course. But I think that we need to add that L-GND on a 400 V system is 230 kV. Half full - Half empty? I don't mind. It's what in it that counts. Hi Mr. Gunnar. For a layman like me and in order to realize that... at point A will have 400kV and at point B will have 0V. It is that? Thank you in advanced. My best regards. No, it is 230 kV, actually. Just as Mbrooke said. You need to understand that the 400 kV are measured between the phases (lines) in a three-phase system while the voltage across the insulator string is 400 kV divided into square root of three. That results in 230 kV across the string. Same as in a houshold system - only at a different level. Usually 400 V and 230 V.
230kv line to ground, in most 3 phase systems voltage is higher between phases then it is to everything grounded. Please. Do not get into a discussion because of my questions and doubts. My intention is try to understand and thank you both. I think this is a fascinating area. From what I realized it is wrong to say that in a three-phase system a conductor has 400kV, because that is the measure between conductors. If you "look" at only one phase, the reference point will be the ground. In terms of insulators the reference point is usually ground- you are only holding back the voltage from one phase to ground. This is the phase to phase value divided by 1.73. So on a 500kv line, the phase to ground voltage is 288kv. 1.73 comes from the square root of 3. Just how the math works out. Thank you Mbrooke! I think in getting there ;) thank you for your time and patience. If by 400 kV you mean 400 kV to ground then the voltage is 400 kV. If by 400 kV you mean a 400 kV system, then the voltage to ground is 230 kV. If the transmission system is DC then the voltage to ground for a 400 kV system will be 200 kV. I can look over either shoulder and see, about a mile away, a 500 kV DC transmission line. 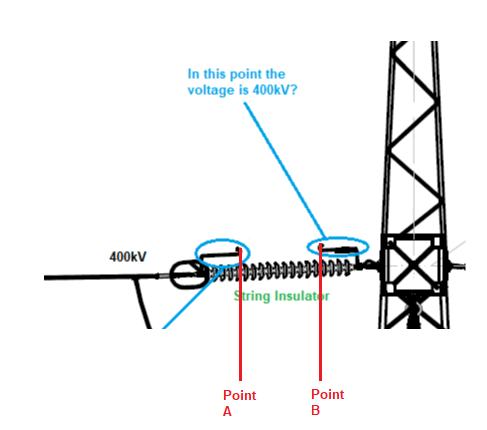 The end of the insulator attached to the tower should always be at zero Volts. If it is more than zero Volts then something has gone very seriously wrong. Bill, why would a 400kV DC system result in 200kV to earth? Keith, I'm guessing Bill was referring to a bipolar HVDC system since that is the type most in use today, and if so, he's correct. "Live and act within the limit of your knowledge and keep expanding it to the limit of your life." Ayn Rand, Atlas Shrugged. Please see FAQ731-376: Eng-Tips.com Forum Policies for tips on how to make the best use of Eng-Tips. Hi X; Hmmm. Bipolar. So +200kV and -200kV on parallel conductors and they call that 400kV? Sort of like calling two 120 Volt circuits with a common neutral 240 Volts. They do carry a neutral with that line. The neutral is a lighter gauge and the insulators strings are much shorter than on the hot lines..
Hello! Absurdly, if a person could climb up the metal structure and sit in Point B, no harm would happen to him? In theory, no harm at all - but you'd be sitting in an area with quite high fields, and making sure that the distance between all your extremities and all the live conductors is comfortably greater than the length of that spark gap is not so easy. In practice, you'd wear a safety tether to stop you breaking your neck when you slipped and fell - then spend the whole time worrying about what happened if the dangling tether got too close to the 400kV line hanging underneath the insulator string (or if it was you dangling close to that line). Sorry for all the vids, but just to give various perspectives. @zeusfaber thank you very much for the explanation was quite enlightening! Mbrooke, Thank you once again for your patience and willingness to help me understand this issue. This forum is certainly very useful especially as people like you who, however banal, who may seem the questions, seek to help and impart knowledge. a) Is a protective element against overvoltage for insulator in OH transmission line & equipment bushings. b) The arcing horn is set with the least path impedance than the insulators such as in the event of flashover overvoltage an arc strike between the air gap on the metallic elements instead of across the insulators. c) Somehow, arcing horn and corona rings installed at the end of the insulator assembly help to reduce the number of the disk insulators while maintaining the desirable electrical strength (BIL & BSL). d) In North America, many OH Lines use corona ring and less common to spec. out arcing horns. In Europe, it is a common practice for overhead T. Lines specify arcing horns in OH T. Line and equipment such as power transformer. e) One of the benefits of using arcing horn is the cost and the capability to operate with high discharge energy of lightning strike or back-flashover overvoltage. f) Some of the downsides of use of arching horns are the wide operation performance due to the weather-related dependance including air moisture, temperature, contamination among other factors that influence the system reliability. g) In the last couple of decades, T. Lines metal oxide surge arresters are used as an option with less weather dependance performance than the arcing horn. 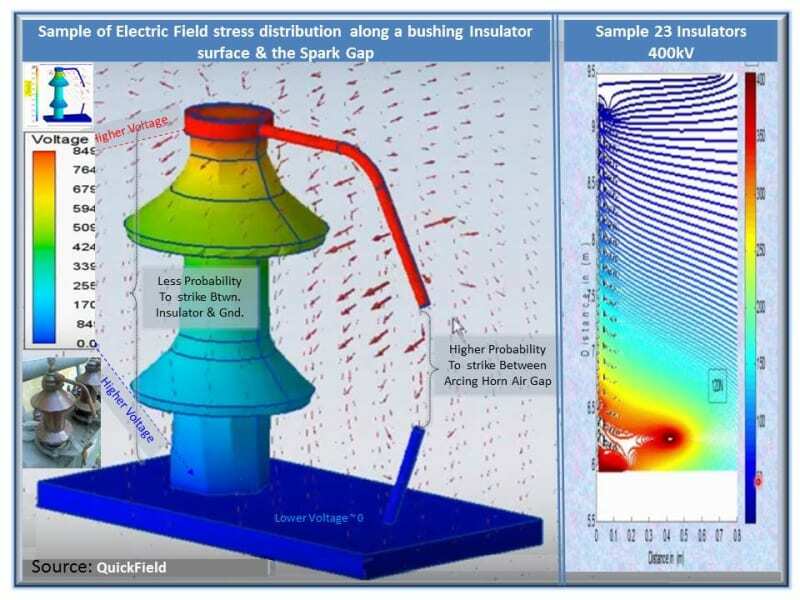 Below is an excerpt showing a sample of the field stress distribution between the air gaps of the arcing horn and across the insulator. I hope this help to visualize the operation performance of the arcing horn. Major disadvantage of arcing horns is that after the surge discharge, there will be a power frequency power flow through ionized air that will cause power interruption. With arcing horns arc flash over voltages are quite high with steep fronted surges ie very little protection.In the days of old type surge arresters(silicon carbide blocks with series air gaps) arcing horns used to be provided with bushings due to erratic protection levels of arresters + to provide uniform protection margins over the entire surge rage. With modern metal oxide arresters, arcing horns are superfluous and rarely used with transformer bushings. Very interesting! In this case, if I understood correctly, the distance between the arching horns should be such that in normal operating conditions, there is no arc between points A (230kV) and B (0V) and in the event of an overvoltage/surge discharge, that same distance, offers the least resistance path, that conduct the discharge by the arching horns and not the by insulator string. I believe you are correct, luis; note however that the behaviour of arc gaps can be graphed similarly to a b-H curve for magnetic hysteresis, in other words once the air between the horns is sufficiently ionized and the air gap breaks down, the established arc will continue to conduct what is essentially fault current to ground, and it is this current that is detected by the circuit protective schemes, subsequently tripping the circuit breakers or other protective devices and taking the circuit off potential. Re-energization of the circuit in a short interval is normally performed by automatic reclosing features, nevertheless there will be a definite, even if very brief, interruption of the power supply. In contrast to this, modern metal oxide varistors, as prc has noted, have a very linear [even if the line is curved] characteristic of conductance/applied voltage, meaning that as the overvoltage subsides and the voltage applied across the varistor returns to its normal range, the varistor's conductance will again fall to next to nothing / its resistance will again rise to a very high value, the upshot being that the line voltage is not collapsed below its normal values as with horn gaps.